The sun is beating down on pretty much all of us today (glory hallelujah!) and if you’re like me, you’re probably going to spend as much time outside as possible to take in the beautiful weather before it disappears again (this is Canada). But when that sun does disappear, most of us are left with thought of sunshine and tanned skin dancing around in our heads. And unless you live right by the beach or have continuously great weather, chances are you probably don’t get as tanned as you would like to over the course of the summer. And when that happens, most likely your first thought in June is to tan to start the summer off right. So where did this whole obsession with tanning come from? Society’s tanning obsession is due to a variety of things. Initially, tanned skin was merely associated with those who were fortunate enough to travel to warmer climates; however, today tanned skin is almost seen as a status identity, thanks to the likes of Jennifer Lopez, Leighton Meester and other A-list celebrities walking the red carpet in sun-kissed style. But if you don’t have the opportunity to be under the sun for all hours of the day, how can you still that sought-after glow? Well, many young people head to the tanning salons to attain their perfect look. 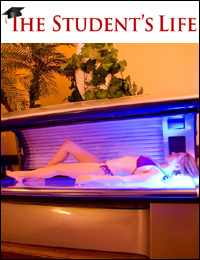 And while tanning beds may look harmless from the outside, are they really? According to Dr. Lisa Kellett, a dermatologist at DLK on Avenue in Toronto, there are more cons than pros to tanning beds. So if tanning beds are so dangerous, how can ladies get that gorgeous glow that is forever in season? Personally, I recommend Jergens Natural Glow self-tanning lotion. It gradually darkens your skin, making it appear more realistic and leaves no streaks. While the smell of the lotion can be overpowering, I just dealt with it because it truly gave me the right amount of colour for my skin. Better yet, it wasn’t expensive!